Business owners are being warned not to put their employees at serious risk after it emerged there are over 9,000 workplace injuries in Northern Ireland each year. 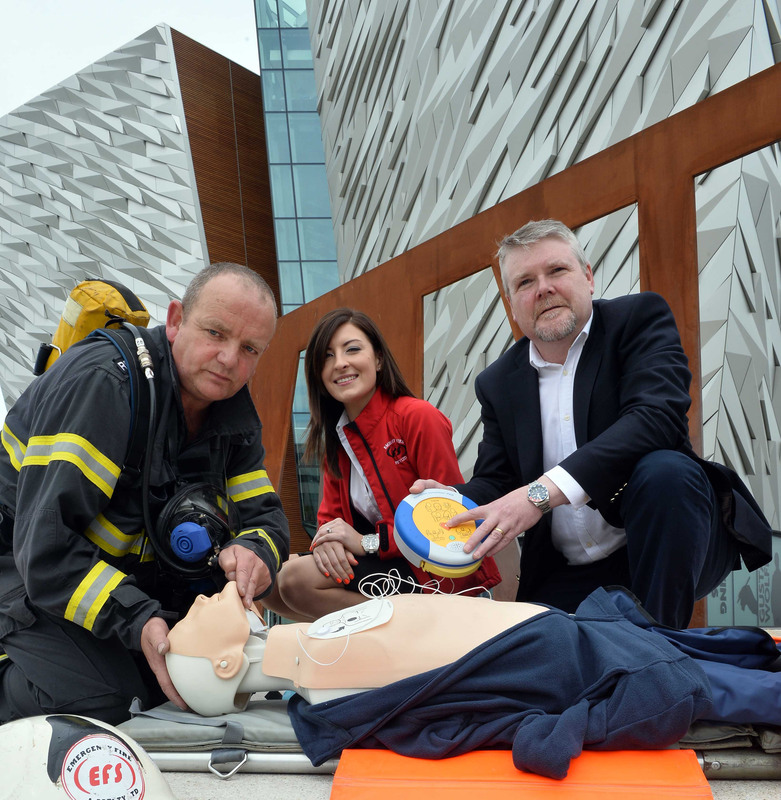 The shocking figure comes as a major health and safety conference is to be held in Titanic Belfast on 16th August 2013 to ensure that companies are prepared for emergencies in the workplace. The conference, organised by Emergency Fire and Safety Limited (EFS) and opened by DETI Minister Arlene Foster, has been sponsored by HeartSine Technologies through the donation of a lifesaving defibrillator and associated training by EFS which will be won by an attending company through a draw on the day. “Regardless of the increase in health and safety in the workplace in recent years, hundreds of serious accidents and fatalities are still occurring in Northern Ireland each year. “Of the 9,000 workplace injuries which happen annually, over 4,000 of these are reportable to the Health and Safety Executive or a local council. “We want to provide businesses with practical information and demonstrations on compliance, training and resources to ensure that they are adequately prepared for all types of on-site emergencies. In association with Arrhythmia Alliance, a charity working to raise awareness of Sudden Cardiac Arrest, the conference will provide all delegates with basic knowledge and skills in CPR and the use of a Heartsine Automated External Defibrillator (AED). “This is a ground breaking Conference as delegates will be demonstrated training techniques utilising resources by industry professionals such as Paul Bryant who developed British Standard Specification PAS 911 – Fire strategies. “It will also be one of the largest CPR and AED practical demonstrations held at a Conference in the UK. “All this is vital information for anyone who has the responsibility of planning, developing and implementing emergency procedures, including owners, directors, Health and Safety and HR Managers. Belfast based HeartSine Technologies is the only company to design, develop and manufacture AEDs in the UK or Ireland. Their devices, which are produced in over 23 languages and deployed in more than 40 countries worldwide, talk the responder through the entire ‘save’ process. “Sudden Cardiac Arrest (SCA) means that the heart has stopped pumping blood around the body. “With CPR alone, SCA survival rates are less than just 5%, but when you combine CPR with the use of a defibrillator, the rate of survival increases to over 70%. “SCA can happen to anyone at any time – males, females, young people, old people, those who are fit, those who aren’t. “The need for defibrillators in the workplace is essential, especially within organisations that have large numbers of employees or customers on their premises each day. “As they guide the user step-step through the process, HeartSine defibrillators can be used by absolutely anyone to keep the victim alive until professional medical assistance arrives. They are the difference between life and death. One of the main speakers will be the inspirational Chris Solomons, a Yorkshire Air Ambulance paramedic who took a Sudden Cardiac Arrest and was saved by his own team members in 2010. A BBC camera crew filming Helicopter Heroes was at the scene at the time and recorded the save. The Emergency Fire and Safety Conference 2013, also sponsored by Latchways, an organisation dedicated to protecting the safety of individuals working at height, and Arco, leaders in safety workwear, takes place between 9.00-3.30pm on Friday 16 August. To book your place, visit www.emergencyfire.co.uk. For more information about arranging the presence of an AED in your workplace, visit www.HeartSine.com. HEALTH & SAFETY HIGH ON AGENDA: Business owners are being warned not to put their employees at serious risk after it emerged there are over 9,000 workplace injuries in Northern Ireland each year. The shocking figure comes as a major health and safety conference is to be held in Titanic Belfast on 16th August 2013 to ensure that companies are prepared for emergencies in the workplace. The conference, which will be opened by DETI Minister Arlene Foster, was launched by organisers Rachael Garrett and Kevin Howlette from Emergency Fire and Safety Limited (EFS) and Andy McClernon, from sponsor HeartSine Technologies, who have donated a lifesaving defibrillator which will be won by an attending company through a draw on the day. To book your place, visit www.emergencyfire.co.uk.